The usual clues to any blown glass bottle (as opposed to one carved from a solid block of glass) are relative lightness of weight, elongated bubbles (particularly around the area of the neck and shoulders), stretching of any colours or streaks in the glass arising from the energy of the blow iron, and a range of rounded shapes that are typical of the glassblower. 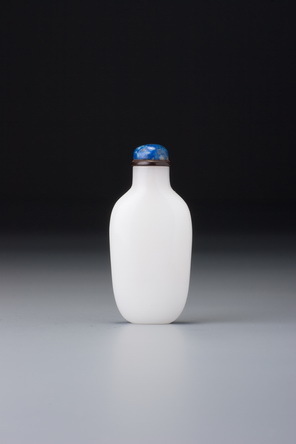 Shapes for snuff bottles were usually modified by moulds, which can confuse the issue to some degree, but there is one useful clue in identifying a blown glass bottle: the interior usually retains a natural fire polish. Certainly with non-transparent glass, where the interior can be seen only through the opening of the mouth, there would be no point in going to the trouble of polishing it evenly to match the exterior. 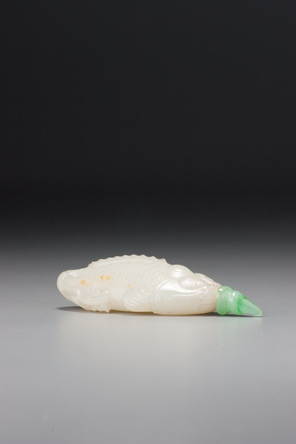 Since most bottles have their mouths carved to make them straight, cylindrical, and of the correct diameter, it is often possible to see the difference between the mouth area, which is lapidary-cut, and the interior, which retains its fire-polish. With this example, employing a small light set at the end of a flexible tube and a magnifying glass, the inside is revealed as having a fire polish, with its slightly undulating surface and natural sheen, while the mouth exhibits the evenness of lapidary tools, confirming the blow iron. This lapidary feature is often left a little rough, perhaps because it is not a significant part of the appeal of the bottle and is unlikely to be noticed in normal use, but also because the slightly rougher surface would give the cork better purchase. Unusually for a blown glass bottle, there are no air bubbles detectable here, even with a strong light and magnifying glass. It is a piece of glass as pure and flawless as any in the collection.